It’s time to write your sponsored child! We will take mail to the children during the June trip. All letters and gifts must fit in a manilla envelope and must be turned in by May 15th. THANK YOU! As a Project 82 Kenya child sponsor, your support helps to ease the financial burden for guardians so that they can focus on making the child feel like a welcome addition to the family rather than an unwanted burden. For a child who has lost their parent(s) prematurely, and often tragically, the environment in the home he or she will transition can greatly influence what his or her future looks like. Your relationship as a child’s sponsor can greatly influence their future, as you have opportunities to encourage your sponsored child and to play a role in his or her social development. You can help your sponsored child develop a sense of confidence and self worth through the love and encouragement you express through writing him or her a letter. The children enjoy hearing from their sponsors. They will often ask team members for news about their own sponsors and they love reading your letters! There are many ways for you to connect with and encourage your sponsored child as you join a community of family, pastors, teachers and friends all coming together to make evident God’s perfect love for that child. You may choose to travel to Kenya with Project 82 on a short-term mission trip and meet your child face to face. 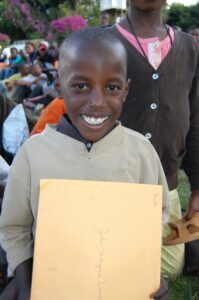 Imagine that child’s excitement when a sponsor travels all the way to Kenya to meet him or her. We deliver letters to the children twice each year, during the June and October trips. We encourage you to write your child. This will help you develop a relationship with your sponsored child and let your child know that you really are interested in how he or she is doing. Keep it simple and clear so that your child won’t have a problem understanding what you are trying to communicate. Write in print, not cursive. Be sensitive to your child’s culture. Avoid mentioning material things or money that might make your child feel inadequate. Tell about yourself. Share about your family, activities, church, interests, etc. Describe the geographical area of where your live, i.e., culture, weather, etc. Explain American holidays or traditions that your child may be unfamiliar with. Ask questions about your child’s friends, interests, activities. You may be surprised to find all you have in common. Talk to your child about your relationship with Jesus. Send Bible verses that encourage you. Encourage your child in school, spiritual development and in whatever they are currently pursuing. Let them know you are praying for them in all things. Let your child know they are loved, and that you are praying for them. Give them lots of encouragement. May I send something to my child? Yes, you may include small items with your letters, such as pictures, stickers, bookmarks, pens, pencils, erasers, small notebooks, small toys, etc. Any candy given will be shared among all the children. If sending gift items, please ensure that everything will fit into a manila size envelope. Do not send money. Will I get a letter back from my child? You will receive a letter from your sponsored child in return. The Kenya staff assist the younger children who do not read and write yet in letter writing and translating. When are letters due? How do I send them? Letters are due on or before June 1st for the June trip, and September 21st for the October trip. Please check social media, and read the eBlasts for reminders and more communications about exact dates for each trip. or dropped off at the P82 office located on the Mt. Bethel UMC campus. There will be a drop box outside the office starting about a month before letters are due. Pray for your child as you are led. They face many of the same things our young people face in America such as peer pressure, stress over testing, and families issues. Pray for them to know Jesus Christ. Pray for school and career opportunities as they grow. Pray for their families to be filled with peace, love, and strength. Project 82 will try to communicate via social media to let you know about needs of prayers, such as when they are testing for exams and other important things in their life. Your can schedule a skype call with your sponsored child. This will always occur on a Saturday and will need to be scheduled through the office and coordinated with the staff in Kenya. I just emailed you my June letter. I’m sorry to be late in getting this to you… May just slipped right past me!